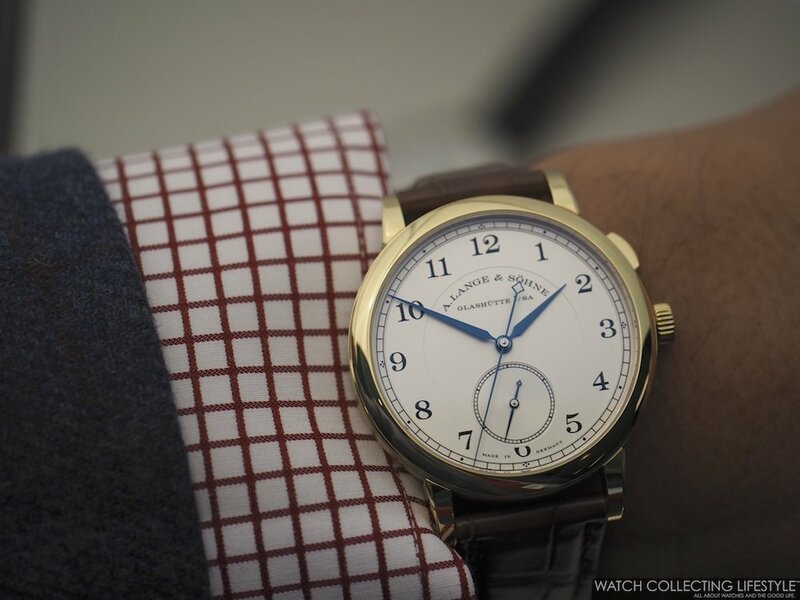 Insider: A. Lange & Söhne 1815 'Homage to Walter Lange'. Honoring Mr. Lange's Favorite Complication. A historically inspired timepiece with dead beat seconds from A. Lange & Söhne to honor its deceased company founder Walter Lange, who passed away in January 2017. The new A. Lange & Söhne 1815 ‘Homage to Walter Lange’ is the first 1815 model fitted with this extraordinary complication. This new watch equipped with a jumping seconds hand that dates back to a 150-year-old invention conceived by Ferdinand Adolph Lange is as classic as it gets. With a case measuring 40.5 mm in diameter, this new watch is available in three different metals and in a unique piece in stainless steel, the 18K pink gold model is available in a limited edition of 90 pieces, the 18K yellow gold one in a limited edition of 27 pieces and the 18K white gold in a limited edition of 145 pieces. These uncommon numbers are derived from important milestones of the Lange family’s history. From 7 December 1845, when Ferdinand Adolph Lange originally established the company, exactly 145 years elapsed until 7 December 1990, the date on which Walter Lange registered Lange Uhren GmbH. Precisely 27 years will have passed between this date and 7 December 2017, the day on which the new model that pays tribute to Walter Lange was first unveiled. In general, mechanical timepieces can be recognized by their sweeping seconds hand. Depending on the balance frequency, the hand advances from second to second in five to ten steps. In short-time measurements; however, where seconds count in the literal sense, constant progression sometimes makes it difficult to pinpoint the beginning and the end of an event. And there is where a jumping seconds/dead beat seconds/true beat seconds comes into play. The 1815 ‘Homage to Walter Lange’ masters both chronometric disciplines. The small seconds hand in the subsidiary dial at 6 o’clock sweeps at the frequency of 21,600 vph; however, the blued sweep seconds hand performs precise jumps from second to second. It can be allowed to run continuously or immobilised if needed with the use of a pusher located at 2 o’clock that can start it or stop it. The jumping sweep seconds hand with the start/stop function was especially significant for Walter Lange. This is because it dates back to an 1867 invention of his great-grandfather, Ferdinand Adolph Lange. It was first implemented in a masterpiece crafted by his grandfather, Emil Lange. One of Germany’s first patents was granted to A. Lange & Söhne in 1877 for the enhanced design of a mechanism mounted on the three-quarter plate, and was referred to as a “one-second movement with a jumping hand”. In the new A. Lange & Söhne 1815 ‘Homage to Walter Lange’, the seconds jump is controlled according to the flirt-and-star principle, as was originally the case in the historic mechanism. After each full second, one of the six tips of the star liberates the tensioned lever arm, which watchmakers refer to as the “flirt”. It then swiftly rotates by 360 degrees before it is stopped by the next tip. This motion sequence causes the seconds hand to advance by one marker. The ratchet wheel located above the three-quarter plate has a dual function: It stores the power needed for the seconds jump, and at the same time causes the sweep seconds hand to stop. An 1815 with jumping seconds likely corresponds to what Walter Lange would have deemed the perfect watch. It is totally reduced to the essence while impressing the enthusiast with a puristic yet technically exciting complication. The blued steel hands contrast well against the silver colored dial with the classic railway-track minute scale. The newly developed movement has a special calibre designation: L1924. It refers to Walter Lange’s birth year. Additionally, the first three digits of the reference number, 297, recall his date of birth, on July 29th. On the wrist, the new A. Lange & Söhne 1815 ‘Homage to Walter Lange’ wears true to its size and impeccably. A great looking watch that will for sure turn into one of the most iconic watches from the brand and one that will for sure increase its value over time. Sticker Price €47,000 Euros —approximately $59,000 USD. For more info on A. Lange & Söhne click here. Posted on February 15, 2018 by Editor & Publisher and filed under A Lange Sohne and tagged Mainstream Brands Homage to Walter Lange 2018 A. Lange & Soehne Most Popular.